Restorative Dentistry is a field of dentistry that focuses on restoring your smile back to optimal health. It includes diagnosing dental problems, the treatment, and repair process of your oral health and functionality as well as the maintenance of your new beautiful teeth. From our state-of-the-art, fully equipped and comfortable clinic, we can help you with any restoration dental service and give you the perfect smile you deserve. Dental bridges are restorative devices used to replace one or more missing teeth. When a tooth is missing, a dental bridge may be used to “bridge” the gap between the remaining teeth. They consist of two crowns and one or more false teeth and are structurally supported by the surrounding natural teeth. There are several benefits to replacing a missing tooth with a dental bridge such as: restoring the appearance and functionality of your teeth, enabling you to speak properly, maintaining the shape of your face and keeping teeth from shifting. Porcelain crowns can be used very effectively to solve a variety of dental problems such as a broken tooth, a weak tooth that cannot stand normal use or a tooth that is worn down. They are also excellent for supporting teeth that have had many or large fillings and are in need of dental implants. At the Versailles Dental Clinic, we use crowns made entirely of porcelain because we feel they create the most natural smile possible by matching teeth perfectly and have enhanced strength and durability without the need for metal bases. White or composite fillings are the best option for you if you are having larger cavities filled, or if you would like to replace your older amalgam or other metal fillings. They are also a good option for restoring teeth that have been moderately damaged by decay. These natural-looking fillings are stronger and even more durable than natural teeth. Implants are replacement teeth that look and feel like your own. Using an artificial tooth root that is placed into the jaw, a replacement tooth or bridge can be securely held into position. They are an ideal option for patients who have lost a tooth or teeth due to periodontal disease or an injury and are actually more tooth-saving than traditional bridgework since dental implants do not rely on neighboring teeth for support. They are also highly successful in providing support for a denture or partial denture eliminating the need for removable pieces. Under proper conditions that we provide, and attentive patient maintenance, dental implants can last a lifetime. They are completely secure and will allow you to speak and eat again with comfort and confidence. Full or Conventional Denture: is the full top or bottom set of your teeth which is placed in your mouth after any remaining teeth are removed and tissues have healed. Partial Denture: is a removable teeth replacement that rests on a framework that attaches to your natural teeth. Sometimes crowns are placed on some of your teeth to serve as anchors for this denture. Root canal treatment or Endodontic treatment is the removal of the tooth’s pulp due to infection or trauma. The pulp, found at the center of the tooth and branching into 1-4 canals, nourishes the tooth when it first emerges through the gum. Once the tooth matures, the pulp can be removed without destroying the tooth as it is now nourished by the blood supply in the gums. The objective of a root canal is to save the tooth by removing the pulp, treating any infection, and filling the empty root canals. 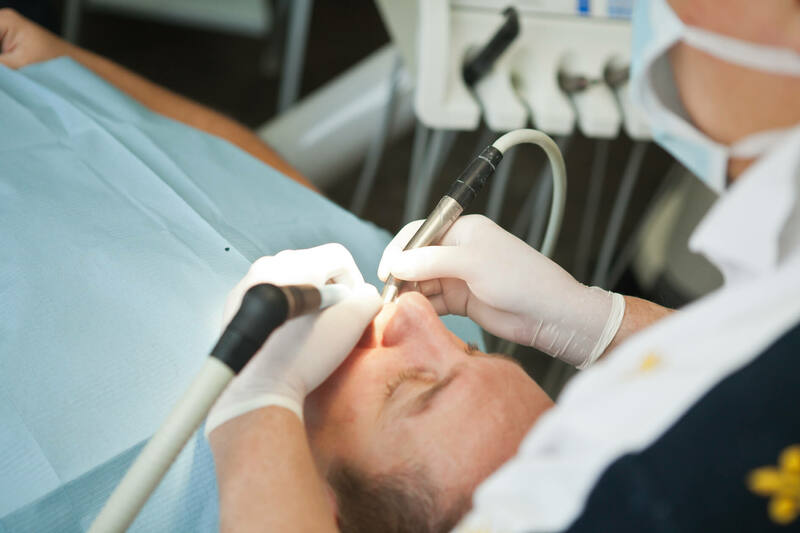 In many cases, without the root canal treatment, the tooth may need to be extracted. It is important to keep your natural teeth to avoid the use of bridges and implants whenever possible. Once a tooth is treated and looked after with proper oral hygiene, it will almost always last the rest of your life. Click here to read more about pre-root canal symptoms. Inlays and Onlays are porcelain durable alternatives to ordinary fillings. They are custom-made by the specialists at Versailles Dental Clinic DUBAI and bonded to the teeth that require repair. Inlays: are bonded in the center of the tooth and are usually used for decayed or damaged teeth where the problem areas are shallow but wide, near the outer surfaces of the tooth. Onlays: are used where there is a large cavity that needs repairing and a previous filling needs replacing. At the Versailles Dental Clinic Dubai, we strive to protect teeth and save as much as possible. Porcelain inlays and onlays not only give more support to your remaining tooth structure but can also greatly minimize the chance that you could eventually require dental crowns, bridges or implants. Professional whitening or chair-side bleaching at our clinic is a highly effective way of lightening the natural color of your teeth without harming the tooth surface. We use only the most scientifically advanced whitening procedure which is safe, effective and takes only 30 to 60 minutes to administer with immediate results. Porcelain veneers can reconstruct several oral cosmetic problems such as misaligned, misshapen or stained teeth. They are extremely thin, custom-made, layered ceramic covers that are bonded to the surface of your teeth. They produce a brighter, straighter or fuller smile with a long-lasting and natural appearance. The diagnosis for your dental restoration may include 1 or more of these procedures. After your complete consultation with your dentist, together you can determine the right way forward to creating your perfect smile.